Dundasite is a rare lead aluminum carbonate mineral. It is an orthorhombic-dipyramidal mineral containing aluminum. It is an orthorhombic-dipyramidal mineral containing aluminum, carbon, hydrogen, lead, and oxygen. It is probably the most famous mineral from the Dundas mines and has a bright orange to red color. It is an uncommon mineral that forms in oxidized lead-bearing deposits. The mineral is named after the type locality, Dundas, Tasmania, Australia. The mineral was first discovered in the Adelaide Proprietary Mine. Dundasite was first described by William Frederick Petterd in 1893. 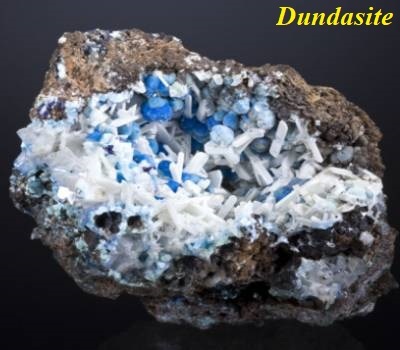 Dundasite is an uncommon secondary mineral occurring in the oxidized zone of lead ore deposits. It commonly overgrows crocoite. It may also be overgrown by yellow cerussite. It is found with other lead minerals such as cerussite and crocoite. Additional localities for Dundasite include others in Australia, New Zealand, Wales, Ireland, England, Germany, Austria, Italy, Greece, France, Morocco, Namibia, and in the United States. 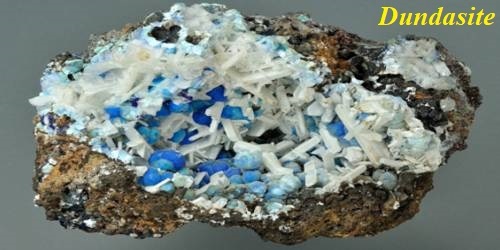 It may be associated with cerussite, plattnerite, azurite, malachite, pyromorphite, mimetite, beudantite, duftite, crocoite, gibbsite, allophane, and limonite.